The Mendola cableway is an attraction in the Oltradige region. Its lower terminus is located in S. Antonio in Caldaro. Beside the normal road, also a funicular railway takes to the Passo Pendola, which was constructed at the beginning of the 20th century. As in these days the means of transportation were rather seldom, it was mainly constructed for touristic reasons. This cableway connected the Mendola with Gries near Bolzano, as S. Antonio used to be station of the Oltradige train. This means of transport was planned by the reknown Swiss architect Emil Strub and completed within 14 months only. Many people, also some aristocrats and the Austrian Emperor Franz Josef, spend a certain period of time at the Mendola mountain, where they made a cure or simply came for relaxation. In 2009 the cabins of the funicular railway were exchanged. Today a glass roof enables you a great view when you drive up and down the mountain. 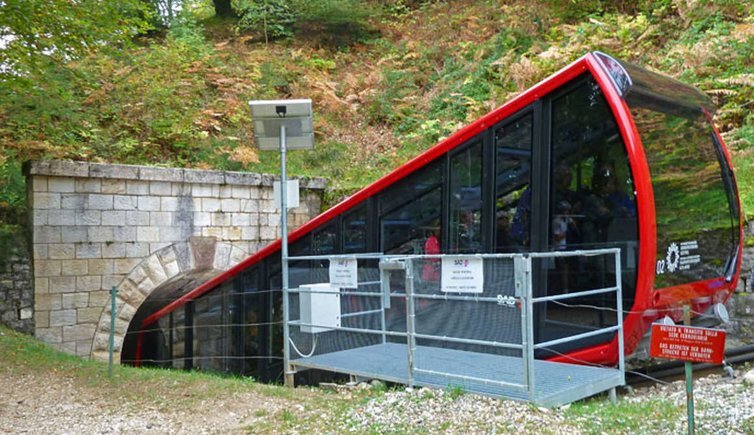 The Mendola funicular is one of the steepest funicular railways of Europe, overcoming a drop of up to 64%. Those who already make a ride know what we are talking about. The course is 4.5 km long and a ride takes you 12 minutes. The Mendola funicular is a perfect alternative for those who would like to save the winding road to the mountain pass. The inhabitants of Appiano and Caldaro love to spend some time in summer on their local mountain, providing a great view on the Oltradige and the Dolomites. Moreover it provides several possibilities for hikes, such as to the Penegal or Monte Macaion or the nearby Roen. The Mendola cable-car is regularly maintained, every year in spring and autumn. In summer and winter it is in service. Please note: in winter the funicular runs later in the morning and only until 5 pm. Please ask for detailed information.